A seventh generation White Witch, Sarah Kulkens uses timeless rituals and spells to help people. This eccentric religion which was once thought of as evil and satanic proves to be quite opposite to its stereotypes. Unfortunately, Sarah is still being bombarded with hate mail for practising witchcraft. Hailing from a long line of witches since time immemorial, Sarah is the daughter of renowned psychic Kerry Kulkens. The family’s first step to fame was setting up Australia’s first magic shop that openly sold Crystals and Tarot cards in 1969. Soon after, the white witches appeared in famous television talk shows, radio shows and wrote for international newspaper and magazine columns. Celebrities and politicians visited the Kulkens’ shop in private for readings. The Kerry Kulkens Magic Shop is located in Belgrave, Victoria, nestled amidst the crisp mountain air of the Dandenong Ranges. Like a time warp into the 60s, a quaint lane unfolds toward the shop, lined with kooky vintage stores. The hippy culture was in full swing, with people walking along the streets draped in colourful raiment. 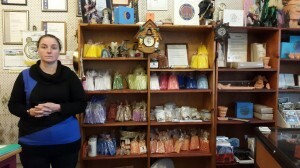 Sarah’s magic shop stocks an array of items from guardian angels for protection to books on witchcraft, voodoo dolls, spell sheets, original crystal balls and crystal wands for healing. Clad in a blue jumper, teamed with formal black trousers, Sarah looks like any other person in town. Sarah follows witchcraft like practising any other religion. ‘Wicca is the oldest religion, and dates back further than even Christianity,’ Sarah said. This witchcraft is a combination of Pagan and Wiccan rituals which involve burning incense, candles and getting in tune with Mother Nature. Nature’s power and force is channelled to heal family and friends. Growing up wasn’t easy for Sarah as the daughter of a famous witch. Witchcraft has long been frowned upon as “evil” and “satanic”. From getting anonymous hate mail, to having her shop burnt down, Sarah has stood strong through the persecution. Sarah relates ‘witches being burnt at stakes’ to a religious-based struggle. She says Catholics and Christians tried to overpower other religions by casting them out. ‘Most people those days had Wiccan beliefs,’ Sarah said, stating anybody with green eyes was suspected to be a witch and punished by being dunked into water. ‘There were also healers who used herbs, potions and make-up concoctions. This was classed as witchcraft then but today, it’s called medicine. People from certain religions twisted this around as being evil because they saw it as a threat.’ This fight for authority is still seen today. Witches have always been stereotypically associated with black cats. Sarah herself had black cats when she was young. But she explains that cats in general have a strong psychic ability and their eyes change colour when danger is lurking around. In black cats, it’s just easier to detect the change in colour. Reverend Mark Tonkin from Belgrave Heights Presbyterian Church opines that Wicca is not on the same wavelength as Christianity. He doesn’t stand for witchcraft and believes it’s the wrong way to communicate. ‘Being a Christian, I think witchcraft is not where the bible is coming from,’ Reverend Tonkin said. The mysterious Dandenong ranges itself fosters a special spiritual energy, drawing people with Wiccan beliefs to the hills. Some heavily rely on white as well as black magic. People might appear “normal” but they claim to belong to covens. They hold meetings daily in the forest, sit in circles and chant, meditate, connect with each other, and ask for Mother Nature’s help when in need. The Kulkens use recipes for potions, spells, rituals and lotions that are thousands of years old. The ingredients have been fine-tuned according to availability to suit current times. Sarah’s great grandmother’s 350 year old spell book calls for ingredients like “wolf’s urine” and “frog legs” which were easily available three generations ago. Some spells require rare ingredients like ambergris – which is bile vomit, musk oil secreted from muskrats’ neck glands and pure rose oil extracted only from white rose petals. Today, Sarah states that new age witches are more mainstream. It was a huge step to openly sell magic in the 60s. But now, tarot cards and crystals can be bought at many bookshops, chemists and gift shops. ‘When mum was in her heyday in the 70’s, middle aged women used to sneak in and have readings. Men had nothing to do with this and considered this sissy stuff. Now, I get anyone from both sexes, ranging from unemployed people to famous politicians,’ Sarah said. Sarah also engages in community work as a volunteer fire worker. One of her roles with the fire brigade include feeding fire fighters on the fire ground. She also hosts numerous classes with psychic self-defence and psychic development most in demand. Sarah says women tend to be more powerful in this domain because they have an extra nurturing ability which connects them deeper with Mother Nature. Being a community-minded person, Sarah has changed the perception of linking witches to satanic practises. More than anything else, Sarah would like to see everyone treated equally and with respect in terms of religion, beliefs or sexual identity. Hi, I saw Sarah’s mum Kerry in the early 90′s for a reading & I still have the tape. I have had some recent anxiety which has caused health concerns, I think it’s time I had another reading to help me get some clarity. I’ve also had lots of spiritual accurances & need some help accepting these & not being fearful. I’d love to see Sarah for a reading (if she does them) & haven’t found any booking or contact information. Could someone please advise? Just like Tanya, I visited Kerry 1990 in Belgrave. I still listen to the tape she gave me because as my life goes on it becomes more and more accurate. in 1990 she told me that North America would be very important in my future. Back then i was a 25 year old intent on emigrating to Australia. In 2006 I actually emigrated to Canada. Kerry really was amazing, the only witch I have seen who I believed. This entry was posted in Culture, Featured, Life and tagged magic, religion, religious persecution, witches. Bookmark the permalink.